The Yankees trip to Tampa? Yuck. Back closer to home, the Bombers make a stop down I-95 at Citizens Bank Park to face the Phillies. The Phils are coming off a Sunday Night Baseball game in Washington D.C. that lasted until 12:30 in the morning. It’s been 12 years since the Yankees visited CBP during the regular season and three years since they last played the Phillies, when Philadelphia took two of three in the Bronx on June 22-24, 2015. Michael Pineda, CC Sabathia and Dellin Betances were each lit up by a rebuilding Phillies squad over the first two games, producing an 11-8 and an 11-6 loss. Then-rookie Maikel Franco was the culprit for a lot of those runs. He went 6-for-8 with 1 2B, 3 HR, 10 RBI, 1 BB and 1 HBP in the first two games. Ivan Nova returned from Tommy John surgery to throw 6 2/3 shutout innings in a 10-2 win to salvage the series. Alex Rodriguez took Cole Hamels deep in the finale. The Phillies’ infield depth is shot at the moment with J.P. Crawford (broken left hand), Pedro Florimon (foot surgery) and Jesmuel Valentin (paternity leave) all away from the team right now. Valentin will likely return by the end of this series, but Franco slipped on first base and left Sunday’s game, so he may be unable to play early in this series. SP Jerad Eickhoff (lat, hand) is on the 60-day DL while relievers Luis Garcia (wrist) and Pat Neshek (shoulder) are on the shelf as well. The Phillies are surprise contenders in the NL East, coming into this series at 41-34. They currently hold an NL Wild Card spot. Despite some early-season hiccups, Gabe Kapler has acquitted himself well as the manager. The team smoothly added 1B Carlos Santana and RHP Jake Arrieta in the offseason and has the payroll flexibility/cadre of prospects to trade in order to add more at the deadline. Aaron Nola has fronted a rotation that has surprised many and been a large reason why the team is so good. The bullpen has held the team back some. In the lineup, Franco has been beleaguered at the plate and Scott Kingery hasn’t found his bearings yet. However, Odubel Herrera has been killing the ball recently and Rhys Hoskins is in the midst of a strong June. Aaron Altherr often gets starts as part of the outfield platoon. Franco is hurt, so Mitch Walding could take a start at third base. Finally, Andrew Knapp and Alfaro each get starts behind the plate. Vinny Velo is supremely talented but his production fluctuates wildly. He’s 11th among MLB starters with 10.87 K/9 and has struck out as many as 12 in a game this season. He also has a propensity to walk a few too many batters and gives up 1.34 homers per nine. He allowed 10 runs a few starts ago against the Brewers. Yikes. His typical start is 5-6 innings, heavily featuring a mid-90s, a low-80s curve and a mid-80s slider. In the past, he’s struggled heavily to go deep into games and has only eclipsed 100 pitches twice this year. It seems like he’ll either have a no-hitter through 4-5 innings or be lit up for 4-5 runs by the middle innings. Arrieta has had a weird season since coming over the Cubs in the offseason. The 32-year-old righty has a 3.42 ERA over 79 innings, but he’s only struck out 54 batters. Through May, batters had just a .601 OPS off Arrieta, but he’s struggled in May, giving up five homers in four starts while walking seven batters in his last three outings. In June, batters are hitting a crisp .284/.359/.494 off the veteran. Yikes. He lives in the low-90s, high-80s with his sinker and cutter/slider, mixing in his curve and change a combined 20 percent of the time. His sinker has produced some high groundball numbers, which is why he’s produced a respectable ERA thus far. Keeping the ball on the ground and in the park is the key for him. Though it’s early, Zach Eflin appears to have broken out in 2018. The 24-year-old has mid-90s fastball and he’s eschewed his bowling ball of a sinker for more four-seamers, changeups and sliders this season. Like so many in our current league, he’s started to strikeout batters, though he’s also limiting homers like he never has before. I won’t forget when Eflin gave up four homers to the Reds last May, was demoted after the game and ready to own up to his struggles to reporters right after the game. No pouting. He knew he needed to work on his game in the minors and he’s showing his talents off now. He’d had already overcome surgery on both knees in one offseason. He’s won each of his four starts thus far in May, though he’s only gotten into the seventh inning in two of nine starts this year and into the sixth in four of nine. The bullpen as a whole has an ERA above 5.00 in June and has probably been the Achilles heel for this team. Kapler employs a closer-by-committee approach after Opening Day closer Hector Neris was demoted to Triple-A. Seven different players have a save for the Phillies, including rookie Seranthony Dominguez. He averages 98 mph on his fastball and has been the Phillies’ best reliever, though he’s started to experience his first hiccups. The slider-heavy RHP Edubray Ramos has been highly effective while veteran Tommy Hunter has struggled. LHP Adam Morgan has strong stuff but has middling results. Rookie RHP Victor Arano and Yacksel Rios have been OK in relatively low leverage outings. RHP Austin Davis is the main long relief option while LHP Zac Curtis could be long relief or a LOOGY depending on the night. Dominguez and Hunter have pitched each of the last two nights while Arano, Curtis, Ramos, Davis and Rios all pitched on Sunday. Rob Thomson, who spent the last 28 years as a part of the Yankees organization, is the bench coach for Gabe Kapler. The nephew of former Yankee Al Leiter, Mark Leiter Jr. is in the minors. Third baseman Maikel Franco was a Yankee target as an international free agent, but the Bombers were outbid by the Phillies by $5,000. 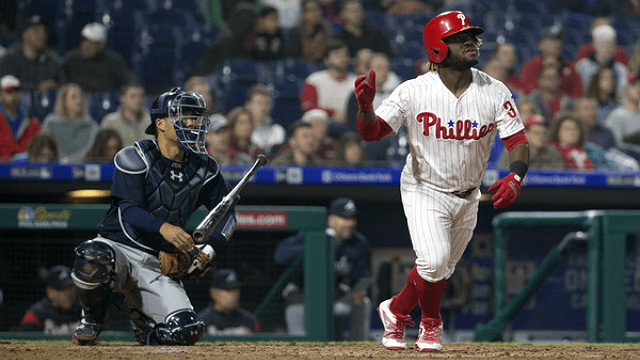 Odubel Herrera! You can almost guarantee you’ll see one highlight catch or drop and an impressive bat flip by the end of Monday out of him. The one-time All-Star looks like he’ll be making a return appearance to the Midsummer Classic. The former Rule 5 pick may just get some MVP votes this year, too. Besides Herrera, the Phillies are one of the worst defensive teams in baseball. Hoskins is a first baseman by trade playing left field while Kingery is normally a second baseman yet has taken over short in Crawford’s absence. However, Jorge Alfaro has a cannon behind the plate like Gary Sanchez. 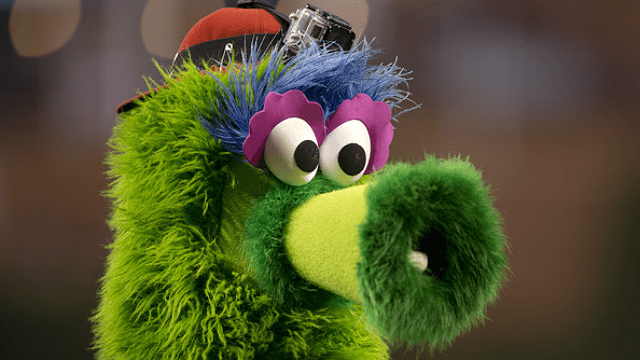 The Phillie Phanatic is a gem. Let’s hope no Yankees get hurt by his mighty hot dog cannon.